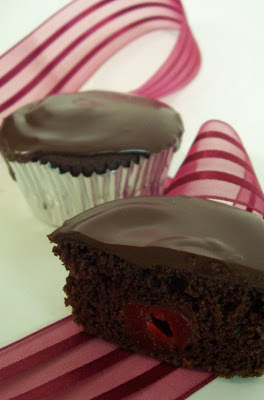 To those of you who have been following my less than completely successful experiments with chocolate cupcakes, I would like you to meet the fruit of my labor: the Chocolate Covered Cherry Cupcake. It may not have the perfect cupcake dome, but in this case, the bug is now a feature, since the lack of slope allows the melted chocolate to harden without running off. As an additional bonus for the extended experimentation, the Cupcake Hero contest theme for May turned out to be cocoa powder, so this will be my first submission to that huge event. Despite initially being geared more toward Mommy's tastes, The Kid adores the the cupcake with a surprise in the middle. Allowing him to eat one results in a chocolate covered child! Preheat oven to 350°F. Line a standard muffing tin with 12 cupcake liners. Sift together dry ingredients and set aside. Cream margarine then add sugar and continue to beat until light and fluffy. Mix in vanilla extract. Slow mixer, then gradually add in half the dry ingredients, then the soy yogurt, then the rest of the dry ingredients. Continuing to beat mixer slowly, add boiling water and mix until fully integrated. Place chips and shortening in a small, heat safe bowl fitted atop a small pot of boiling water. Stir until melted, then spoon onto cupcakes. If necessary, spread with a circular motion. Allow to cool before consuming, if you can. Makes one dozen decadent cupcakes and provides incontrovertible proof that food allergies do not cause a life of deprivation. These sound absolutely yummy! My 2 year old, who has a dairy allergy, thanks you! That would seem your experiments paid off. Love that you make the bug a feature! Brilliant! These look tasty! I wouldn't have even guessed they are egg, nut and dairy free. I love chocolate covered cherries. I'll give these a try.